For those of you in the West Hollywood, CA area, some sad news has been discovered. 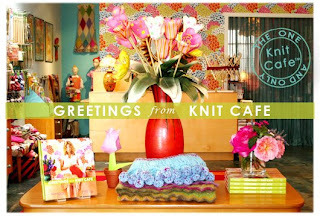 Suzan Mischer's store, Knit Cafe is closing its location on Melrose Ave. She has yet to find another location with realistic rent, so, after April 6th, we'll only be able to shop with her through her website. I met a new friend there also - Doug Laughlin (on Ravelry and Men Who Knit) was there - so that was neat - we talked about the upcoming crochet class he's going to be teaching this Sunday at the shop - it's 99% confirmed - if you're remotely interested, please call Suzan at the store and reserve a space. From what I understand, it'll be a basic overview of crochet - which, in my opinion, is a good set of knowledge to have; especially for those of us who like the whole free form thing! Also, the following Sunday (April 6th), Doug is hosting a men's knitting group at his place in West Hollywood. It's the first of its kind - if you're interested in meeting up with the men's knitting group, contact me or him and we'll get it all arranged. So, just a quick sad post - its frustrating that rent and finances must drive so many decisions in our big grown up world - but I understand the plight of the small business owner. I did beg Suzan to move her shop closer to the valley- she has the most amazing color sense and the products she carries (carried?) in her shop are stunning. A pinwheel blanket update - I bought a 60" circular needle at Knit Cafe yesterday - the blanket fits on this size needle *already*! - So, I think I need to buy 2 more of them - but it's coming along. I am on a set of rows using Ozark Handspun that I bought a year or two ago from the Knot Garden in Encino - it was on clearance and I was in LOVE - I couldn't go to sleep last night when I realized that it was the next fiber in the blanket - and I HAD to do one round of knitting with it - it's so soft and beautiful and all the little tufts of fiber are gorgeous! I want more more more of this amazing yarn - and highly suggest if you're doing a blanket or something free form that you invest in a few skeins of this yarn!! Go check out knit cafe one more time before it's gone - get Suzan's book if you don't already have it - and gather up a few good deals at the shop while you're at it! This location is closing for good on April 6, 2008. And, if you're interested in the men's knitting group, email me. Hi there....since you live in the valley and you seem to be in market for a new local knitting shop...have you checked out the Studio City knittng store, La Knitterie Parisienne...talk about dying and going to yarn heaven!